Figure 1. The analyzer instrument is set up on a desk (above left). There is a small diameter tube running from the back of the analyzer to a hole in the wall, then outside and up a mast to just above the roof (above right). The water vapor isotope analyzer (Picarro) is collecting continuous samples of air and analyzing them for the isotopes of water vapor (δ18O and δ2H in a molecule of H2O, or water). 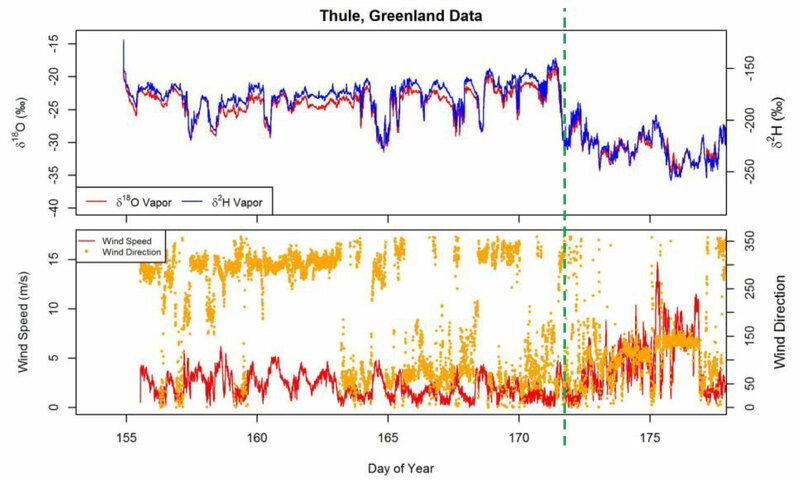 These isotope measurements (Figure 2) help to understand many hydroclimate processes such as the environmental properties of moisture sources and atmospheric trajectories (e.g., across open water, sea ice, or Greenland Ice Sheet). Analyses of these data result in a process-based understanding of hydroclimate patterns across multiple temporal and spatial scales.